My sister and I celebrated her birthday by taking a cruise along the east coast of Canada and the USA (New England). 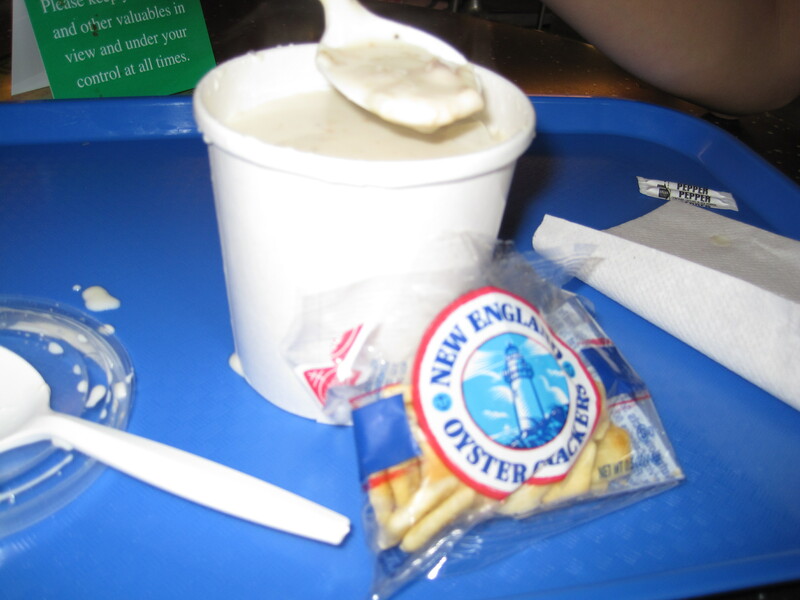 Being a huge fan of clam chowder, I was naturally excited to try New England clam chowder from New England. Unfortunately, having only a few hours at each port, we were only able to try clam chowder from Boston, MA, and Bar Harbor, Maine. But we were not disappointed. We also sampled two major brands of oyster crackers. Here I share my reviews of the chowders and the oyster crackers, as well as my own recipe for a quick and easy New England clam chowder (photos at the very bottom of this post). Be warned, this is a full fat, high caloried recipe. 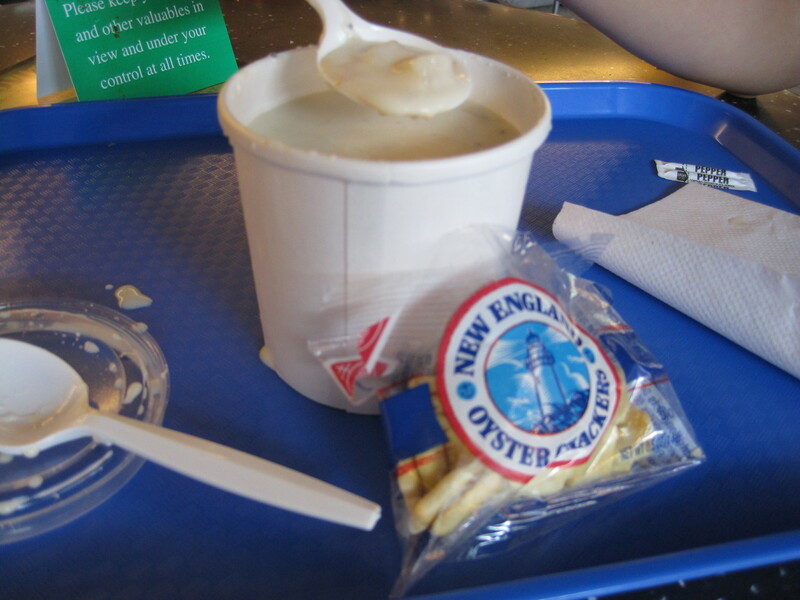 When we were in Boston, we tried the “New England Clam Chowda ‘Voted Boston’s Best’ ” from Boston Chowda and it was the best I have ever had! Photo below. To start, the temperature of the soup was piping hot. The potatoes were cooked perfectly, the clam’s weren’t overcooked or tough, and the consistency of the soup was exactly how I like it, creamy and substantial but not too thick. Also, the ratio of potatoes and clams to soup was perfect. 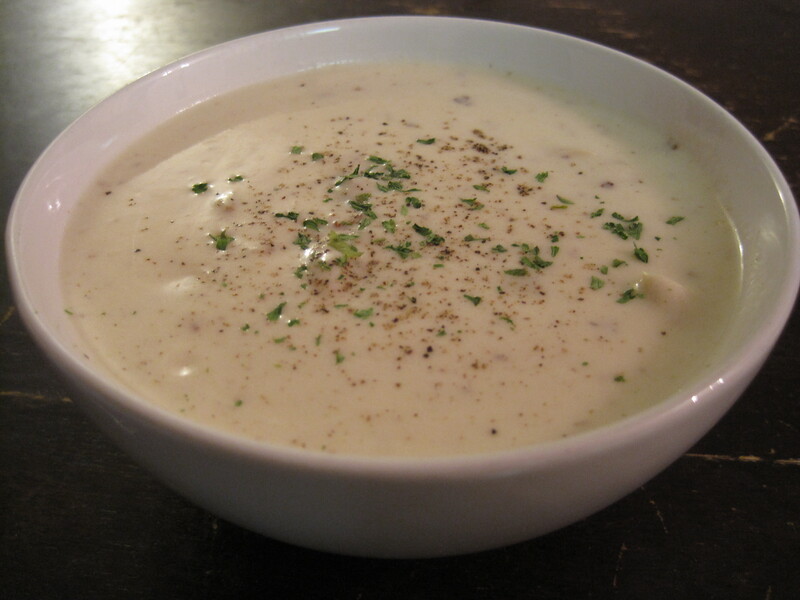 Boston Chowda can be found at the Prudential Center (where we had it), at Quincy Market in Faneuil Hall, and in North Andover. 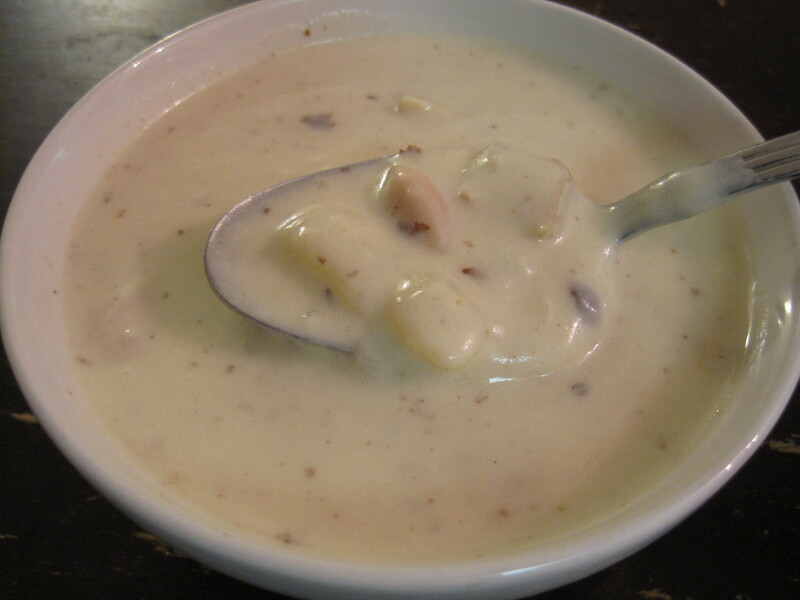 We didn’t have a chance to taste test the clam chowder from Legal’s Seafood – a restaurant that is often voted as having the best clam chowder – but I plan to the next time I visit the city. In Bar Harbor, we had clam chowder at a restaurant made famous by President Barack Obama – Stewman’s Downtown (review of that restaurant here). Although we really enjoyed our meal and dessert, their clam chowder was not at all enjoyable in comparison to Boston Chowda’s. The soup was too thick and too salty for my taste, and the clams were overcooked and very tough. Also, it wasn’t served hot enough. makes 4 servings; Note: Although homemade clam broth would work best, I have substituted with bottled clam juice and chicken broth to avoid the hassle of working with sandy fresh clams. In a large heavy bottomed pot, cook the bacon in 1 tbsp oil over medium heat until crispy. Remove the bacon and reserve for some other use. Add the onions and saute until translucent, stirring constantly, about 2 minutes. Add the clam juice, chicken broth, and potatoes and bring to a boil. Meanwhile, make the roux. To make the roux: In a small, heavy bottomed sauce pot, melt the butter over medium heat. Whisk in the flour, a little bit at a time, and cook for 2 to 3 minutes, whisking continuously. When the broth has come to a boil, reduce the heat and maintain a medium simmer until the potatoes have started to soften, but have not yet reached the desired tenderness, about 2 minutes. Note that this cook time will vary depending on the type of potato you’ve used and the size of your cubes. While stirring continuously, add the roux a little bit at a time. Maintain a medium simmer and stir occasionally until the soup becomes thicker than your desired consistency, about 3 to 5 minutes. Add the clams. Then gradually stir in the cream and milk and simmer until you achieve the desired consistency. Note that this could take up to 10 minutes, but be careful not to overcook the potatoes or clams. Add salt to taste. Serve hot with ground black pepper and crackers on the side. That is so nice of you, Kim! I wish I was good enough to get paid to write 🙂 Have a great day! Thanks so much for your nice comment! I have considered trying an alkaline diet before. I’m not currently looking for guest writers for my food blog but would be happy to consider being a guest writer on other peoples’ blogs if that’s something you might be interested in. Thanks again for writing! If you’ve had chowder from Boston and Maine- you’ve officially done it. I wouldn’t worry cause your not missing much else. You got the Brad Pitt of chowder.